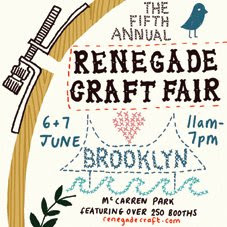 Today and tomorrow there is a Renegade Craft Fair in Williamsburg's McCarren Park from 11AM - 7PM. It's free and there will be more than 250 booths. You can check out the amazingly comprehensive list of vendors here.